While the majority of our political gaze is fixed on the race between the Democrat presidential candidate Hillary Clinton and the Republican candidate Donald Trump, the Libertarian Party candidate Gary Johnson's Election Day plea is worth tuning into for reasons that extend beyond our current election. It's all too easy to discount the validity of his seemingly sad plea, considering the fact that Johnson wasn't allowed to debate Clinton and Trump during the three 2016 presidential debates leading up to our suspense-filled Election Day. With our heavy two-party system even Johnson doesn't expect to win the election itself, however, his slim-to-none chance of winning presidency hasn't stopped him from campaigning for a different end goal: securing 5 percent of the vote. 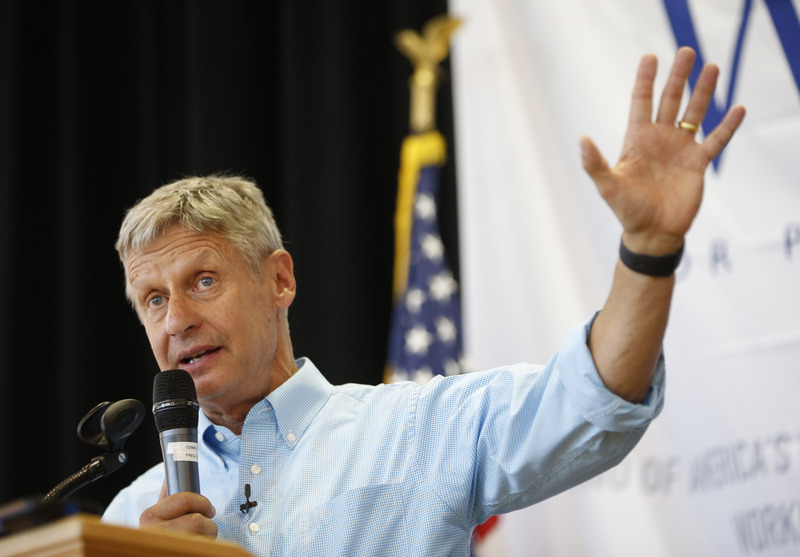 At first glance, the concept of winning 5 percent of the national vote may sound insignificant, but if Johnson manages to cross that threshold of support, the Libertarian Party would qualify for Federal Election Commission (FEC) funding in the 2020 election which could ostensibly challenge the two-party system and change the way elections function in the future. With that in mind, Johnson's tenacious commitment to campaign up until Election Day seems slightly less depressing, and instead reflects the long game played by a man who once genuinely asked: "What is Aleppo?" So given the stakes for third party voters and libertarians in particular, what exactly are the chances of Johnson securing 5 percent of the national vote? In theory, his goal isn't outlandish considering Johnson polled at 7.6 percent in the final IBD/TIPP Election Day Tracking Poll, a polling system that has been considered the most accurate presidential polling system in the last three elections. His national polling average has hovered around the five percent range for weeks, with the latest national poll from FiveThirtyEight placing Johnson at 5 percent of the popular vote, with the possibility of electoral votes at a predicted 0 percent. However, for those placing hope in the correlation between Johnson's polling percentage the amount of popular votes he'll actually receive, it's important to consider that during the 2012 election Johnson polled at 5.1 percent in a CNN poll leading up to Election Day, before receiving 1 million votes which totaled in only 1 percent of the national popular vote. At this point, assuming either the success or failure of Johnson's campaign is a close call. Needless to say, his third party opponent, the Green Party candidate Jill Stein has faced greater difficulty garnering support, with a recent CNN survey placing Stein at 2 percent in the polls. The persistence from both candidates and growing support for Johnson begs the question: will this election be the one that shifts our two-party system? We will find out soon enough.